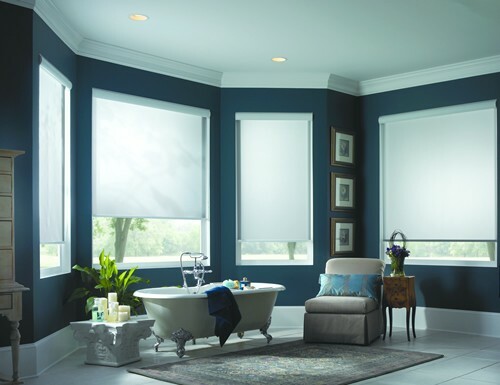 Our Modern Eco Solar Screen Roller Shades use DOW’s unique ECOLIBRIUM Bio-Based Plasticizer. ECOLIBRIUM is an eco-friendly solution that lowers greenhouse gas emissions. They also offer many designer colors and textures in a variety of percentages. These shades will allow you to see out to various degrees while also reducing the UV rays coming in. A lower percentage will allow less light to come through while also allowing less visibility out. A higher percentage will allow more visibility while also allowing the most visibility out. Note: Some shades will be seamed and railroaded due to the their size. If you have any questions on this, please do not hesitate to give us a call or use the chat feature. W: 8" 9" 10" 11" 12" 13" 14" 15" 16" 17" 18" 19" 20" 21" 22" 23" 24" 25" 26" 27" 28" 29" 30" 31" 32" 33" 34" 35" 36" 37" 38" 39" 40" 41" 42" 43" 44" 45" 46" 47" 48" 49" 50" 51" 52" 53" 54" 55" 56" 57" 58" 59" 60" 61" 62" 63" 64" 65" 66" 67" 68" 69" 70" 71" 72" 73" 74" 75" 76" 77" 78" 79" 80" 81" 82" 83" 84" 85" 86" 87" 88" 89" 90" 91" 92" 93" 94" 95" 96" 97" 98" 99" 100" 101" 102" 103" 104" 105" 106" 107" 108" 109" 110" 111" 112" 113" 114" 115" 116" 117" 118" 119" 120" 121" 122" 123" 124" 125" 126" 0/0"1/8"1/4"3/8"1/2"5/8"3/4"7/8" H: 8" 9" 10" 11" 12" 13" 14" 15" 16" 17" 18" 19" 20" 21" 22" 23" 24" 25" 26" 27" 28" 29" 30" 31" 32" 33" 34" 35" 36" 37" 38" 39" 40" 41" 42" 43" 44" 45" 46" 47" 48" 49" 50" 51" 52" 53" 54" 55" 56" 57" 58" 59" 60" 61" 62" 63" 64" 65" 66" 67" 68" 69" 70" 71" 72" 73" 74" 75" 76" 77" 78" 79" 80" 81" 82" 83" 84" 85" 86" 87" 88" 89" 90" 91" 92" 93" 94" 95" 96" 97" 98" 99" 100" 101" 102" 103" 104" 105" 106" 107" 108" 109" 110" 111" 112" 113" 114" 115" 116" 117" 118" 119" 120" 121" 122" 123" 124" 125" 126" 127" 128" 129" 130" 131" 132" 133" 134" 135" 136" 137" 138" 139" 140" 141" 142" 143" 144" 145" 146" 147" 148" 149" 150" 151" 152" 153" 154" 155" 156" 157" 158" 159" 160" 161" 162" 163" 164" 165" 166" 167" 168" 169" 170" 171" 172" 173" 174" 175" 176" 177" 178" 179" 180" 181" 182" 183" 184" 185" 186" 187" 188" 189" 190" 191" 192" 0/0"1/8"1/4"3/8"1/2"5/8"3/4"7/8"
The solar blinds were exceptional! The solar blinds were exceptional! They are beautiful and fit perfectly. Easy to install, very fast delivery. Highly recommend!